As indications for hip arthroscopy continue to expand, its efficacy in patients with more complex deformities of the hip, such as those with acetabular dysplasia, remains controversial. The purpose of this systematic review is to identify the predictors of failed hip arthroscopy in dysplastic hips and to propose a standardize prognostic sub-classification of dysplasia. This systematic review was performed in accordance with the (Preferred Reporting Items for Systematic Reviews and Meta-Analyses) PRISMA guidelines. Three databases [EMBASE, PubMed, and Ovid (MEDLINE)] were searched using terms including “hip arthroscopy” and “dysplasia”. Studies were screened and data extracted in duplicate. Study quality was assessed using the Methodological Index for Non-Randomized Studies criteria. Due to the non-uniform nature of study data, findings were presented in descriptive summary form. Thirteen studies were included in this systematic review, comprising 712 dysplastic patients (773 hips) with mean age 34.2 years and 74.1% females. Most studies defined hip dysplasia by a lateral centre-edge angle (LCEA) of 20°–25° (borderline) or 15°–20° (moderate). Failure was defined as progression to revision arthroscopy, peri-acetabular osteotomy, or total hip arthroplasty. Overall, failure rate was 192/743 (25.8%) at an average of 28.1 months following index arthroscopy. Smaller LCEA, larger Tönnis angle, broken Shenton line, and decreased joint space (≤ 2 mm) were radiographic predictors of failure. Severe cartilage lesions to the femoral head or acetabulum were associated with failure in five studies. Labral debridement led to more failures than labral repair. Overall, hip arthroscopy yielded good outcomes in mildly dysplastic hips without severe chondral damage. 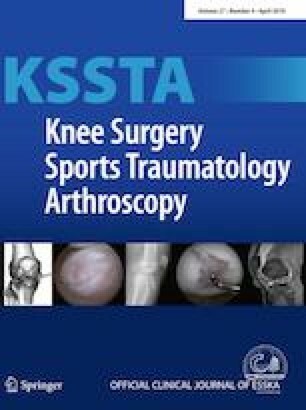 Hip arthroscopy is expected to result in a failed outcome in individuals with moderate-to-severe hip dysplasia (LCEA < 15°), severe cartilage lesions, larger Tönnis angle (> 20°), broken Shenton line, and decreased joint space (≤ 2 mm). Arthroscopic surgery may be more effective in individuals with borderline-to-mild (LCEA 15°–25°) acetabular dysplasia in the absence of severe cartilaginous lesions (7-year survival: 89.6%). A standardized prognostic classification of hip dysplasia based on the LCEA and Tönnis angle is proposed. Systematic review of non-randomized studies, Level IV. The original version of this article was revised: Author name was incorrectly published as Sochi Uchida insted of Soshi Uchida in the original publication. The online version of this article ( https://doi.org/10.1007/s00167-019-05416-3) contains supplementary material, which is available to authorized users. A correction to this article is available online at https://doi.org/10.1007/s00167-019-05494-3. Sincere thanks to the Health Sciences Library at McMaster University for their assistance in creating a valid search strategy. JK and MM performed the literature search, title, abstract, and full-text screening. AS performed the hand-search of references, data extraction, and wrote several drafts of the manuscript. NB, SU, and ORA thoroughly edited and provided guidance with respect to preparation of the manuscript. ORA conceived the study and participated in its design and coordination. All authors read and approved the final manuscript. No funding was received for the implementation of this study. ORA is a paid consultant for ConMed. NB is a consultant for Stryker, receives accommodations and travel expenses reimbursement from Smith and Nephew, and receives royalties from Dedienne Sante. SU is a consultant for Smith and Nephew and ConMed. The authors have no other potential conflicts of interests to declare. The present study was done in agreement with the ethical standards of the institutional and/or national research committee and with the 1964 Helsinki declaration and its later amendments or comparable ethical standards. Ethical review board approval was not required for this systematic review.